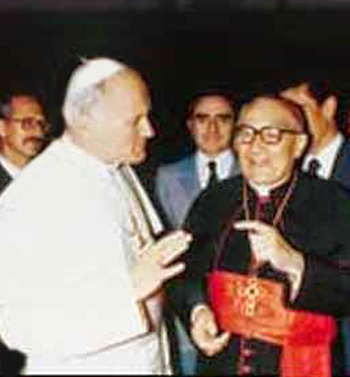 As the content of the 1948 “Memo” shows, the Papal Commission operated as a lobby group with the evident intention to gain the ear of Pius XII so as to influence future legislation on the liturgy. Below, using the internal evidence of the “Memo” itself, we will see how the Commission set out to achieve its aims. First, it created a fake controversy over the authenticity of the Church’s centuries-old lex orandi, making it seem that somewhere along the way the Church had made a wrong turning. Then, having cast doubt on the integrity of Tradition, it proceeded to control the terms of the debate as follows. The pseudo-controversy: Veniat or Exsultet? We are left to marvel at how many false or tendentious remarks he could fit into one paragraph. Who the historians are is not disclosed; but from Antonelli’s account, their opinions have as much credibility as the plotline of Dan Brown’s Da Vinci Code novel insofar as both are rooted in misinformation and constitute a concealed, indirect assault on the integrity of Catholic Tradition. Let us take each of his points in turn. As any competent historian of the liturgy would know, from the early centuries of the Church, it was the deacon’s office to light the Paschal Candle, and that he was also given the privilege of performing its blessing during the Exsultet. Fr. Antonelli did not mention that this tradition was based on an immemorial custom of well over a thousand years, being attested to in the ancient Gallican Sacramentaries e.g. the 7th century Missale Gothicum, (4) one of the forerunners of the Roman Missal. Nevertheless, the Commission decided to bring it to an end in 1956 without, however, being able to offer a single good reason for the change. That was how the blessing of the Candle was peremptorily transferred from the long, elaborate and impressive hymn of the Exsultet sung by the deacon in the sanctuary, to the one-paragraph prayer of the Veniat spoken by the priest outside the church. Was there any need to change the blessing of the Candle from the Exsultet to the Veniat? Let us examine the Commission’s claim that the Veniat was the “real prayer of blessing,” and should have been retained, while the Exsultet, which the Church had chosen for that purpose was, by implication, unauthentic. The historical evidence shows that neither blessing was, in fact, any more or less “real” than the other. Both have an excellent pedigree, of roughly similar antiquity, in the Gelasian and Gallican Sacramentaries respectively. As the Exsultet eventually became more popular and widely used – indeed, it became the most prized of all the jewels of the Easter Vigil – it was both obvious and natural that the Church gave it priority over the other prayer for inclusion in the Roman Missal as the blessing of the Candle. It is noteworthy that this priority arose not by bureaucratic fiat from on high – as in the 20th century reforms when the Veniat was imposed – but from the historical fact that the Exsultet proved to have more widespread popular acclaim. In other words, the blessing of the Candle was not legislated by a Commission or other tribunal, but emerged as an implicit preference among the community of the faithful. And that before the expression “organic development” was invented. By 1956, it is evident that unseen interests were exerting enormous control over the future of the liturgy. The text of the “Memo” was available only to “insiders” and to no one else. Under cover of secrecy, the Commission attempted – and failed – to prove that the Church had made a faux pas. We can now say that it was not simply unscholarly, but dishonest to claim that the Veniat was the “real” prayer of blessing of the Candle and that it should supplant the immemorial custom of the Exsultet. There is absolutely no evidence to support that claim, much evidence against it, and even more evidence that the liturgical “science” underpinning it was fabricated. We can conclude, therefore, that the Commission members arrived at their judgment only by leaving out a key element of liturgical history – its “organic development” – and skewed the historical evidence to fit their a priori theory. This is a typical example of how the Commission took a counter-position against long-established, universal traditions simply on the basis of their own subjective preferences. As with the rest of the Easter Vigil, indeed with the entire Holy Week, centuries of hallowed customs were scrutinized by members of the Commission with a view to eradicating them on flimsy or false pretexts. Thus, the lex orandi, the very locus of sanctification of the faithful and the principal means of replicating the Faith in successive generations, became a particular target of officiousness and bureaucratic control. 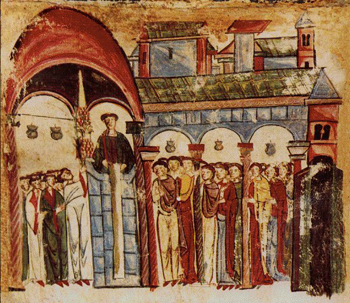 The Commission worked to ensure that Tradition would henceforth no longer be master in its own house, but had to cede authority to abstract theories beloved of liturgical “experts” and historians. Next, we will see how transposing the blessing of the Candle from the Exsultet to the Veniat had another unwarranted effect: it changed the theological significance of the Procession from a carefully choreographed pageant dramatizing the fact of the Resurrection as a historical event, to an unstructured melee in which the Paschal Candle (representing the risen Christ) was outshone by the People’s candles. ‘Le Cierge Pascal’ (The Paschal Candle), La Maison-Dieu, n. 26, March 1951, p. 24. Lambert Beauduin (‘Le Cierge Pascal,’ ibid.) complained that “the deacon never blessed any object, especially before his superiors.” The priest is, of course, the ordinary minister of blessings. 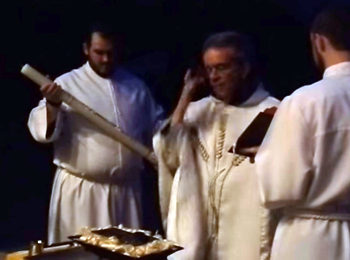 But at the Easter Vigil the deacon was given the exceptional privilege of acting as his deputy to bless the Candle, using the flame from the new fire and the five grains of incense blessed by the priest earlier in the ceremony. Henry Marriott Bannister (Ed. ), Missale Gothicum, a Gallican Sacramentary, London: Biblioteca Apostolica Vaticana. MSS., 1917, p. 67. Lambert Beauduin, ‘Le Cierge Pascal,’ p. 24. The Novus Ordo rite mentions only the “Preparation of the Candle,” not its blessing.